Bakeries are more popular in Macedonia for the snack foods they make rather than the bread. 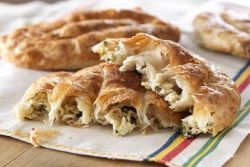 Burek is the most consumed baked food in the country right after bread and comes with a number of different fillings. 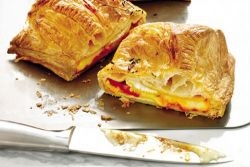 Burek is made from phyllo dough stacked on top of each other and filled with one of the following: meat, white cheese, spinach, garlic or with pizza filling. Most popular is the burek prepared with either white cheese of minced meat and is usually consumed with a glass of yogurt. Although relatively cheap, burek is delicious and very satisfying a 1/4 of a pie is enough for a grown man. 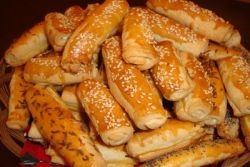 Banica is a pastry that is very similar to burek and comes with the same dough and even the same fillings. The difference is in the size and the fact that banica is also made with sweet fillings such as fig or apple jam and with fillings such as only cheese or salami. 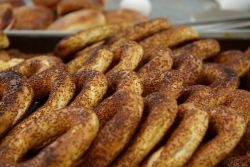 Gevrek (Simit) is a circular baked bread with sesame seeds, it can be cooked, baked or both and is often consumed with yogurt. It is the cheapest baked good you can buy and it goes as low as 10-15 denars, which is from 15 to 25 euro cents. Solenki are pastry made from dough which is sprinkled with sesame seeds and although can be plain they are usually have filling. Solenki are traditionally made in the home although many bakeries offer them as well. Fillings are various and can be both sweet or not. Sweet fillings include different jam fillings, where as the salty fillings include white cheese, garlic or spinach. 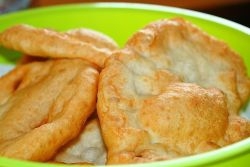 Mekici are not baked but fried and are type of pastry that consists only of home made dough. Mekici are versatile as they can be combined with jam, sugar, sweet figs or other type of sweet products or white cheese with yogurt and even ajvar. Mekici have a special place in Macedonian cuisine, a mother of a newborn baby invites friends and families to visit and see the baby and traditionally serves home made mekici.